Rozmiar podglądu – 445 × 600 pikseli. Inne rozdzielczości: 178 × 240 pikseli | 583 × 786 pikseli. Plik Anna Atkins algae cyanotype.jpg znajduje się w Wikimedia Commons – repozytorium wolnych zasobów. Dane z jego strony opisu znajdują się poniżej. This appears to be an exact copy of the photo at http://static.photo.net/attachments/bboard/001/001YSO-5138484.jpg as retrieved 12 August 2009. The 31 July 2001 entry about the photo at http://photo.net/bboard/q-and-a-fetch-msg?topic_id=23&msg_id=001X7G does not mention the source of the photo, but it appears to be a resized and recolored version of the 2004/2009 photo on the New York Public Library page http://digitalgallery.nypl.org/nypldigital/id?419608. Therefore, per http://www.nypl.org/legal/, under "Use of Content From NYPL Websites... 4. Credit NYPL When You Use Materials From Our Website," this page should indicate "Courtesy of The New York Public Library www.nypl.org." "Image Title: Dictyota dichotoma, in the young state; and in fruit. 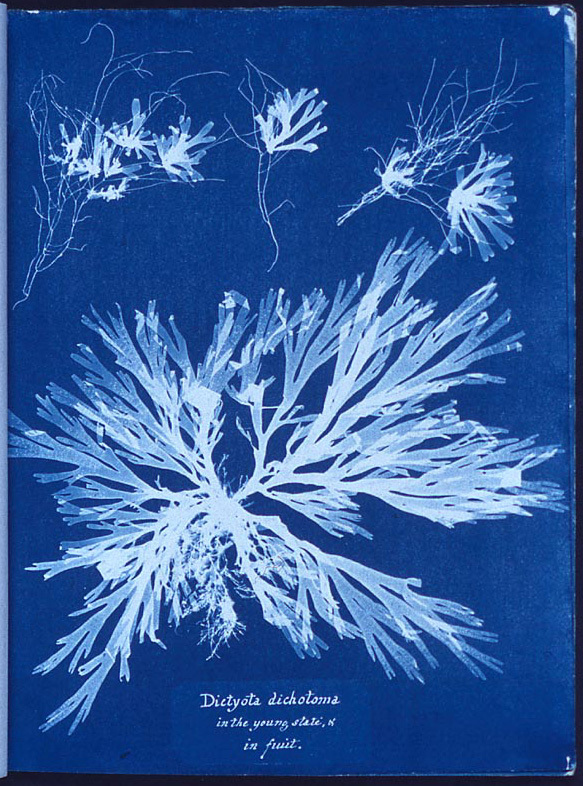 Source: Photographs of British algae: cyanotype impressions. / Part XI. Digital Item Published: 3-31-2004; updated 2-12-2009"
aktualny 04:14, 11 gru 2005 583 × 786 (241 KB) Cormaggio A w:Photogram of w:Algae, made by w:Anna Atkins as part of her 1843 book, ''British Algae'', the first book composed entirely of photographic images.